Paul grabbed this Aimor at a Virginia flea market for $40. 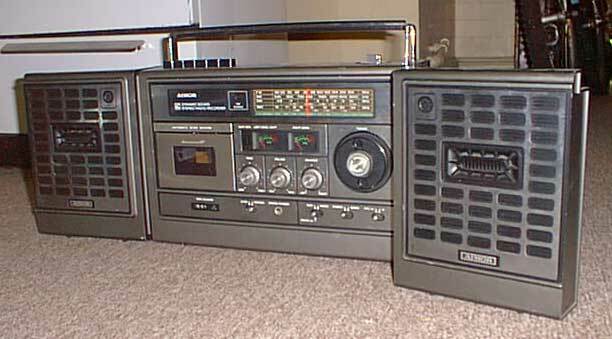 It’s an oddity from the late ’70s–portable stereo with detachable speakers, multi-band radio and cassette deck. There’s an FM stereo LED, metal knobs to control tone, balance and volume. This sucker is heavy and is a grayish green in color–a real boat anchor as far as boomboes go. Never heard of Aimor, but it was made in Japan and is of pretty decent quality. This entry was posted in Boombox Birth by pocketcalculatorshow. Bookmark the permalink. I actually owned one of these mine was defective and tried to send it out for reapir but no luck.